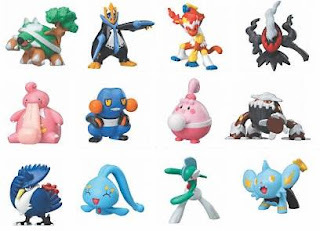 Bandai will release 12 figures of Pokemon Clipping series in November. Size is 1.9"-2.7", it's a candy toys, pose is natual and clipping from actual scene. First series was released in April. Bandai Pokemon Super Get Series 13, will release 10 figures of Pokemon DP in January. Updated summary list of released figure, refer to Pokemon DP figure release summary. Bandai Pokemon Kids series DP6, will release 13 figures 14 figures at 8 January. Updated summary list of released figure, refer to Pokemon DP figure release summary. Dialga is the new pose. 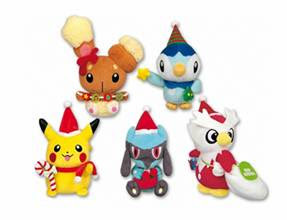 New Pokemon plush, Christmas version, Pikachu, Piplup and Pachirisu will be introduced by Pokemon center at 3 November. Size is approx. 5.8-6" height. Pokemon Christmas cake is introduced by Bandai, with Piplup and Buneary figures and Pikachu watch. Booking will be started during middle of October - December in Japan. Next item is not relation to the Pokemon figures, but would like to post. 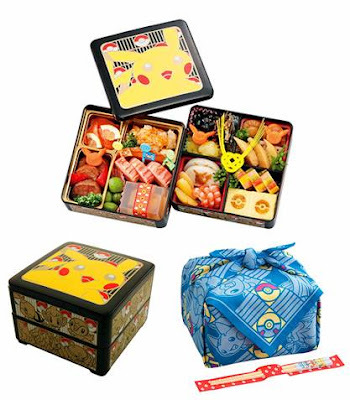 This is a traditional foods set for Japanese new year with special box. Foods is calling Osech. If you will be there New Year's Eve in Japan, it is available. Access: Takashimaya online shopping, Booking end: 20 December, Delivery : 31 December. As for DP series, nothing from Tomy in December. Next release is January. 2 DP new figures and 1 renewal figure will come during January - March. In February, 3 Battle Scene series figures will come additionally . Tomy will renew 3 figures, Venusaur, Charizard and Blastoise at 16 December. Left figure in the following photo is current one, right is renewal. 1 or 2 renewal figure will come during January - March. As for other renewal, please refer to search result. 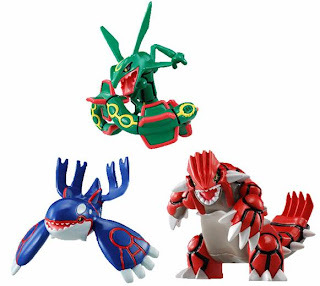 Tomy will release 3 figures in Battle Scene series, Kyogre, Groudon and Rayquaza are dynamic pose at 27 December. So far Dialga, Palkia, Darkrai, Torterra, Infernape and Empoleon were released. Lugia, Ho-Oh and Lucario will come in February. 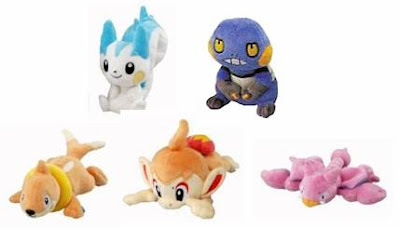 The following posts are Pokemon Figures and plush release info of major series in October 2007. Nothing from Yujin 3D Pokedex Series in this month. Next DP06 release is in December. As for other items in Japanese version, also pokemon cards DP4 series, 3kinds Magmortar vs Electivire Deck/ Moon Hunting / Night Dashing and Pokedex toys (display equipment) will be released at the end of October. New Pokemon plush, Christmas version, Pikachu, Delibird, Piplup, Buneary and Riolu will be introduced by Banpresto in the middle of October. Size is approx. 5.5-6" height. These are game prizes. Tomy will release 5 new Pokemon plushes, static pose with soft material at 19 October. Photo for Bandai Pokemon Super Get Series 10, figures release in October is uploaded.